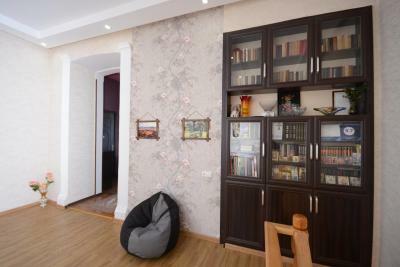 Lock in a great price for Guest House Metreveli – rated 9.7 by recent guests! Our hostess was charming - She made us feel very welcome. great host. Felt welcomed the moment we arrived. Even our kids made friends with the neighbours and didn't want to leave the house to go see the city. We felt like we were at home. Highly recommended if you are not looking to splurge and luxury. Great Value!! Great hospitality from the owner. Solid house, clean and cozy. The hosts were extremely kind. We got cool melon just as we arrived after a hot day and we had the best breakfast in our 12 days in Georgia. The lady of the house was ready to answer all our questions. She prepared for us an excellent breakfast and we even received some khachapuri to go. As other guests have said, Nino and her family were gracious, generous hosts. They made us feel at home in their home right away. The inside bathroom has a toilet, shower and laundry for the guests to share. In case that one is occupied, there's another bathroom with a toilet outside. The bathroom was always clean and well stocked. Additional plusses were being able to do a load of laundry, watching World Cup in the living room, having great conversation with other guests in the garden and hanging out with their 2 super cute kittens Kit and Kat. Nino and Anna always offered coffee, tea, their homemade wine and snacks like fruit and even cake! I don’t know how to express the feeling we had once entered the house of Nino and her family! It was totally awesome, we were greeted with home made wine and wonderful toasts! Then we got an exclusive master class of kinkhali, which turned out the best meal ever! During dinner daughter Anna sang us songs with her angel voice!! I mean I can’t tell everything... just come and experience it yourself! Nino and Temo were extremely friendly & hospitable. They treated us with some homemade goodies. If you like Temo will drive you to Vardzia & Rabati for a very reasonable price. And last but not least, they have a super furry & funny cat. Make sure you ask what her name & story is. Long story short-highly recommended! Nino, the manager and main figure at the property, is a superbly hospitable and attentive person. The generous spirit she has reminds you of the authentic and kind hearted people of the old days. The guesthouse is directly on the main road and it's not hard to find. 2 small markets are few steps around the property. Center of Borjomi is around 1 km away. One of our best sellers in Borjomi! Guest House Metreveli offers accommodations in Borjomi.Offering free private parking, Guest House Metreveli also features free WiFi throughout the property. You will find a kettle and a flat-screen TV in the room. A shared kitchen is available. For your comfort, you will find slippers and free toiletries. 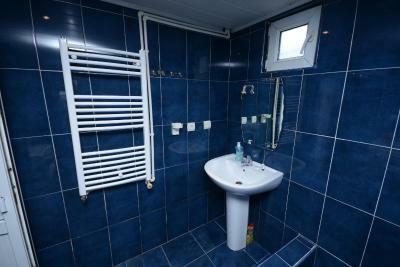 The nearest airport is Kutaisi International Airport, 52 mi from Guest House Metreveli. 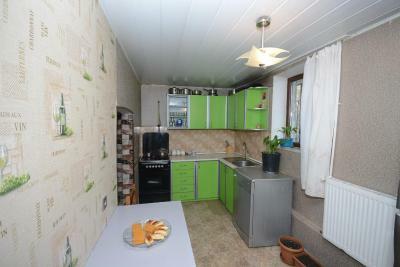 This property is also rated for the best value in Borjomi! Guests are getting more for their money when compared to other properties in this city. 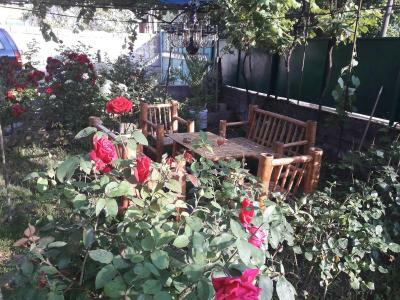 When would you like to stay at Guest House Metreveli? House Rules Guest House Metreveli takes special requests – add in the next step! Children 2 and older are allowed at this guesthouse. Guests need be quiet between 10:00 PM and 10:00 AM. A lovely family. Made me feel very welcome, made my stay very comfortable. :) Good balcony! The room was comfortable but quite tiny. They welcomed us with a bottle of home made wine and a small lunch which was totally amazing and super tasty, everything was exceptionally clean, the room itself looked very nice and had a mountain view. It was a 5 minute walk to the bus station, out of the center which made it very quiet. The owner was extremely welcoming and friendly. Very nice hosts who made us feel at home. They helped us with our questions and welcomed us with homemade wine and chacha. The place is very close to the National Park. The owners are very friendly and make you feel like home. The room was beautiful! Very friendly host family. We were welcomed with tea and snacks. Our host was very hospitable. Upon arrival she prepared a delicious aperitif, including homemade vine and chacha. This was clearly the best experience we had in Georgia. Perfect guest house. I felt like a family member always got food in the evenings as well as coffee tea and a lot of chacha!!! This was the most welcoming guest house I have stayed in so far! Everything went perfect, they are a really nice, positive and welcoming family, I just felt like home. Confortable, clean, great value for money. I recommend 100%. Thanks for everything i had a great stay at your home! Nino, our host, was extremely nice and kind. She greeted us with delicious georgian dinner and home made wine and we had very nice time together. You can feel that she does this from her hearth and we felt very welcomed in this warm house. Also the room and the bathroom were very nice and clean. We definitely want to return! Nino and her family are so welcoming!! They offered wine, food, chacha, tea, coffee and conversation and made us feel like at home. The house is very comfortable and it is near the national park. Didi madlova for everything!! The hosts of these Guesthouse welcomed me with open arms. The room and the bathroom were very clean and the atmosphere is really cozy. The entry to the national park is just a 10 min walk away. I would stay there again any time. I would have preferred to have the option of having breakfast. But you can use the kitchen if you like. The only batroom is downstairs (shared with 2 other guestrooms) which makes it slightly inconvenient at night. Very nice and friendly family. The rooms are renovated and we had a very comfortable bed. The wife speaks English, the husband speaks Russian. The brother that lives nextdoor (also a guesthouse by the way) organizes daily tours to nearby attractions which was very convenient for us. The location is not touristy but its a short and easy walk to the center. Very nice people, very friendly. Beautiful small guest house. Nino and her family are great hosts! We were welcomed with homemade food and wine in the shady courtyard and enjoyed sitting together and talking in the evening. A highly recommended guest house.